Wellington, July 21 NZPA - Opposition MPs have welcomed the moratorium placed on new major irrigation consents on Canterbury's Hurunui River but want further protection. Environment Canterbury commissioners requested the moratorium from Environment Minister Nick Smith and he approved it on new water takes from the river and its tributaries from Friday until October 1 next year. In a letter to Dr Smith on Monday commissioner chairwoman Dame Margaret Bazley said the Hurunui catchment did not meet criteria in the Environment Canterbury Act, it faced increasing demand, was nearing full allocation and in lower reaches suffered diminished water quality. She said the river and tributaries were subject to multiple and overlapping statutory processes. Dr Smith said the purpose of the moratorium was to enable a comprehensive plan to be put in place for the Hurunui ahead of major consents being considered. Consents for a massive 42,000 hectare water project, a water conservation order and the natural resources regional plan were all being considered simultaneously. "This Government is committed to developing the irrigation potential of the Hurunui River, but it wants to ensure that this is done in a careful and balanced way," Dr Smith said. Green Party co-leader Russel Norman welcomed the moratorium but said a water conservation order was needed. "It's like a national park for rivers and if we had a water conservation order on the Hurunui then we could protect it for all New Zealanders for all time." There could be full protection of the Hurunui already if the Government had protected the river earlier, he said. "The people of Canterbury do not want their rivers drained and polluted." The moratorium only lasts until the next election -- likely to be soon after October next year. "We'll see what happens after that." 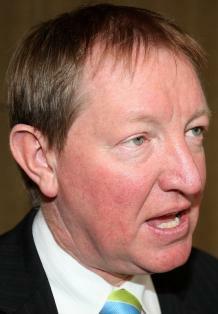 National wanted to expand irrigation in Canterbury but had been forced backwards, Dr Norman said. "The Green Party, the green movement and the public have mobilised effective opposition which has held them for the moment." Labour MP Brendon Burns said the moratorium was inevitable. People in Canterbury were concerned about increased contamination of waterways from industrial agriculture, he said. "Dr Smith is playing for time with the Hurunui moratorium which runs, conveniently, until around the time of next year's election." The moratorium should be extended to other Canterbury rivers and streams until new environmental rules were in place, he said. United Future leader Peter Dunne said the moratorium gave recreational users more opportunity to have their say on the river's future. "The future of the Hurunui River is not only important for the future of North Canterbury but is a real precedent setter for the future of wild rivers in this country."